Ask yourself this question Why would someone want to choose to do business with me instead of my competitors? Your answer is the first part of your U.S.P. Many businesses fail to carefully define Who they are in the business world, and simply continue selling their product or service until the money runs out. A couple of examples of companies with high quality U.S.P.s are Fed Ex and Dominos in the 80s. Do you remember this ad? Get fresh, hot pizza delivered in 30 minutes or lessor its free. or How about If it absolutely, positively, has to be there overnight. Those are just a couple of good examples of the Unique Selling Proposition. Another example is our own U.S.P. Grow Your Business 25% 100% in 90 days without spending more money on advertising, GUARANTEED. What is your U.S.P.? Do you have one yet? USP is your unique selling point. 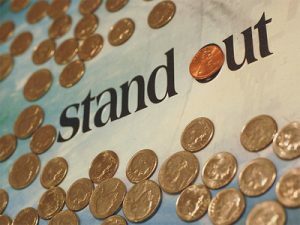 Also called your unique selling proposition, it is what sets you and your business — or you as an individual — apart from your competition. It can be an actual fact or a perceived difference or specialty. Every business needs one. They build on the premise that its easy for a customer to request changes. Benefit to the customer: Satisfaction. No hassles (for trying to change the standard burger offerings) and a hamburger thats just the way you like it. Enterprise: Pick Enterprise. Well pick you up. While Avis made a name for itself with its Were number two, We try harder slogan that emphasized customer service, Enterprise focuses on one key selling point customer pick up. Benefit to the customer: Convenience. You dont have to worry about taking a cab or bother with finding some other way to go get your rental car. It comes to you. Many products, such as paper towels or toilet tissue, have similar qualities. Bounty makes their mark by saying that their product absorbs spills faster. Benefit to the customer: Time-Savings. You get the dirty work done sooner and can get on to other more important matters. When youre doing desktop publishing, on the surface youre offering the same thing that thousands of others are offering. How do you set yourself apart? Look at what you do and how you do it. Look at your current customers (or those you wish to attract). What do you do? If you have a broad offering, can you focus on one or two key services that are most in demand? List your specialities or niche areas. How do you do business? Is there something special, unusual, or significant about the way you do business? Do you offer 24 or 48 hour turnaround? Do you deliver for free? Who are your customers? Look at the demographics age, interests, location (local, all over the world). What do your customers want? Is it low-price, your personality, your location, your reputation, or something else that attracts customers to your business? List the benefits that customers derive from you. There may be very little difference between your product and your competitors — but if you cant find a way to communicate uniqueness and connect it to a need of your target, you might as well quit fighting your competition and sell out to them.